Edward Bertie Bell was born in Yeovil in 1887 but very little is known of his early life as I've not managed to find him in any census records. In reporting his death the Western Gazette referred to his mother as Mrs H Abbott of Camborne Place and to Edward as Private H Bell (that's the Western for you) but the Commonwealth War Graves Commission records his mother as Alice Annie Abbott of 4 Camborne Place - I could find no records for her either. The Western Gazette reported that prior to enlisting, Edward was employed by F Dimon & Co - presumably the leather dressers and degreasers of Alexandra Road. In any event Edward enlisted at Sherborne in 1914 as Private (Service No 230829) of the 1st Battalion, Dorset (Queen's Own) Yeomanry. 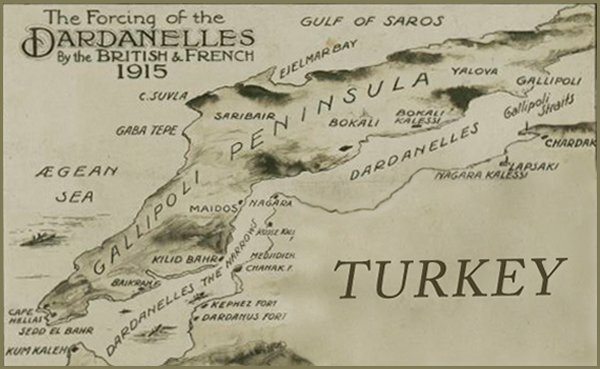 For two hours during the early morning of 21 November the village of Enab was shelled heavily by the Turks and, owing to the congested state of the village -packed with troops and animals - casualties were heavy. It was during this fire-fight that Edward Bell was reported wounded and missing but it was later confirmed that he was killed in action in the Battle of Nebi Samwell on 21 November 1917. He was 30 years old. Other Yeovil men killed in this battle were Harry Holland, Wilfred Purchase, Thomas Luxton, Frederick Barnes and Frederick Wickstead. The Western Gazette reported on 21 December 1917 - "Mrs H Abbott, of Camborne Place has received official notification that her youngest son, Private H Bell, of the Dorset Yeomanry, is reported wounded and missing since November 21st, whilst serving in Egypt. Private H Bell enlisted soon after the outbreak of hostilities and has been at the Front for two years. 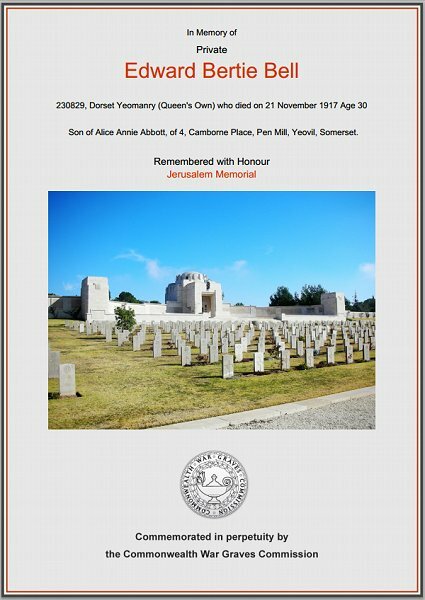 Previous to joining up he was employed by Messrs. F Dimon & Co."
Edward is commemorated on Panel 3 of the Jerusalem Memorial and his name is recorded on the War Memorial in the Borough. The Commonwealth War Graves Commission certificate in memory of Edward Bell.